And now, in a fit of laziness, I will reproduce a post I wrote earlier for the University of Kentucky's official blog, The Daily Entomologist (more accurately dubbed The Erratic Entomologist). Due to copyright concerns resulting from that blog's public nature, I was unable to publish this post with the illustrations: Life, et al. is not bound by such restrictions. Nonetheless, "Flagellate Tarsi & Stick Insects" will feature fewer pictures than hitherto, since the subject–an enigmatic family of Mesozoic insects called the Chresmodidae–hasn't ever been featured in any life restorations. Anyway, the wonderful thing about paleontology is that the extinct things one encounters through it are not always directly analogous to modern life forms. Dinosaurs, trilobites and ammonites–the Holy Trinity of paleontology–are all certainly not alien, but they aren't just humdrum prehistoric blueprints of their current ecological counterparts, being rather something distinctive and apart. Fossilized insects, unfortunately, do not often diverge dramatically from modern ones: it seems that once a body-plan evolves among them it is never lost, and if its exponents die out utterly it will likely be recapitulated later on by an unrelated lineage. The notorious griffinflies (order Meganisoptera) that patrolled Earth's skies for 67 million years, including the 28-in.wingspan Meganeuropsis, were essentially hawk-sized dragonflies (a taxonomic oversimplification but an ecological truth); the various members of the superorder Dictyoptera (cockroaches, mantids and termites), both living and dead, are more or less Variations on the Theme of "I Am a Roach"–e.g., We Are Roaches With Sclerotized Forewings (Umenocoleidae), We Are Carnivorous Mantis-Like Roaches (Raphidiomimidae), I Am a Roach With Earwig-esque Cerci With Which I Probably Clasped My Mate (Fuziidae), and I Am a Roach With Leaping Hind Legs and a Name Like That of a Romulan (Skok). Thankfully, there are exceptions. The Kalligrammatidae were fluttering, colorful pollinators often termed "the butterflies of the Mesozoic"...but they were close kin of antlions (which they hardly resembled), and are only distant cousins of their extant namesakes. (See "Butterflies Before Butterflies, Flowers Before Flowers".) And, of course, there were the Chresmodidae, which are what I am posting about, although it may be hard to tell that from what I have written so far. Chresmodids were spindly insects with slender, elongated legs. Females were winged; males, wingless. Their wing morphology (and venation), cerci, and ovipositor unanimously point to an affinity with the Polyneoptera, a varied assemblage of such organisms as grasshoppers, earwigs, and praying mantises (although chresmodids were classified elsewhere as recently as 1980). The fact that chresmodid nymphs are known (indicating that, like polyneopterans, they exhibited incomplete metamorphosis) seals the matter (Delclòs et al., 2008). But beyond that their relationships are debatable–this being but one of their interesting aspects. Glancing at a specimen of a chresmodid (particularly if it is a nymph) one is impressed with a general similarity in habitus to a water strider (Gerridae), a living bug with which all are familiar. This resemblance is not coincidental. Chresmodids, too, possessed velvety tarsi (feet)–an adaptation in water striders to prevent breaching the surface tension of the water on which they skate (which is far from the most peculiar of chresmodid tarsal features, as we shall see): paleontologists have thus deduced that the subjects of this post also hunted and scavenged on the surface of water, propelled by warping the ductile meniscus with pressure exerted through their feet (as can be seen in the photograph below). Interestingly, in Recent times only some members of the order Hemiptera (true bugs)–to which the Chresmodidae certainly do not belong–have such a lifestyle among the insects. If the analogy holds true, though, one can't help but notice that Chresmoda sp. 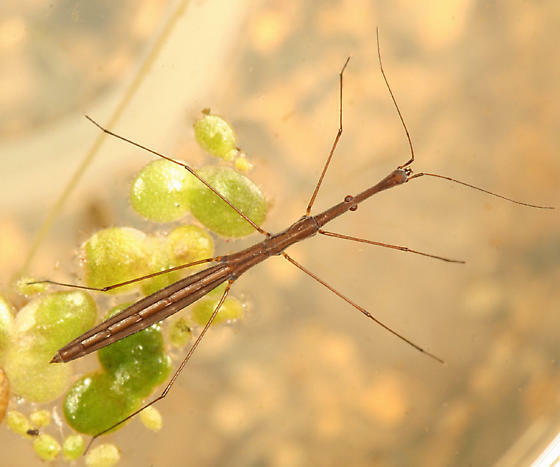 grew to sizes far greater than any water strider: an adult female C. neotropica's wingspan was 55.6 mm (with far lengthier legs), and it wasn't even the largest species (Delclòs et al., 2008): by contrast, Gigantometra gigas, the largest water strider, has limbs that span 36 mm (Andersen, 1982). 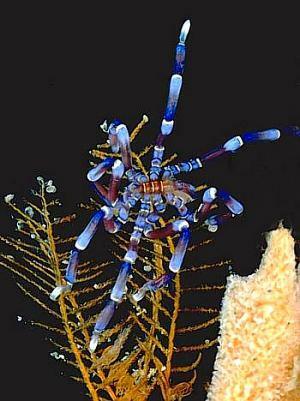 Given that Gerridae already push the limits of physics by walking on water, one wonders how the heck their vaster polyneopteran counterparts did so. Of course, the idea that they were aided by vegetative flotsam cannot be discounted; but if so, why have water striders (and other surface-inhabiting hemipterans) not also taken advantage of this and thus grown to comparatively behemoth sizes? A good number of chresmodids (including the largest species) lived on brackish waters (i.e. 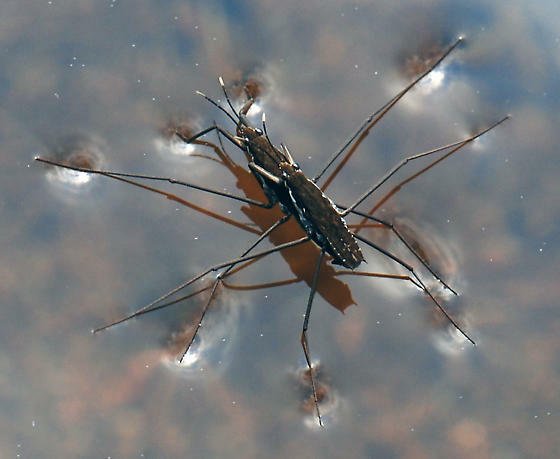 lagoons), meaning that they had the advantage of increased density (since more salt=denser water)–but members of Gerromorpha (the infraorder to which water striders & co. belong) are tolerant of salinity as well. No, it appears that Chresmoda sp. owe their gigantism to a unique aspect of their tarsi: namely, the fact that said tarsi were unreservedly flagellate, the 2 foremost tarsomeres (the segments which comprise an insect's foot) being subdivided into an excess of 40 tiny articles in what was apparently a means of spreading weight (Martínez-Delclòs, 1991). Why does this warrant italicization? Well, the foundational morphology from which all insects descend has no more than 5 podites: numerous lineages among the Insecta have less than that, but never more, with the strange exception of Chresmoda. In search of an explanation for the sinuous feet of the Chresmodidae we venture into the wily realm of developmental genetics. Possibly, a gene regulating segment multiplication in the antennae shifted to the legs, which, these limbs being serially homologous, is not implausible; or perhaps the gene responsible for tarsomere arrangement simply went overboard with the apical podites ("over-expression"). However, additional mutations in unrelated parts of the genome–specifically, those parts dealing with tarsal musculature–would be necessary in order for the newly super-multiarticulate feet to function. This could explain why this route for dealing with supporting one's weight on fluid occurred only once in the insects (Nel et al., 2004); but however it appeared, the chresmodids were certainly successful in their own time, living for at least 80 mya (Aalenian-Cenomanian Epochs) at both ends of Eurasia and in South America. What killed them off is open to conjecture, but the greenhouse event that occurred worldwide ~92 mya might have done it (Delclòs et al., 2008); if so, chresmodids' fellow victims included the fearsome carcharodontosaurids (among other things) (Brusatte and Sereno, 2005). The gates of Hades swing wide and from the abyss comes Damon diadema! Oddly enough, though, arachnids are no strangers to whip-like tarsi, the feature appearing independently in the orders Amblypygi, Uropygi, Schizomida, Palpigradi, and Opiliones. Of these, only Opiliones (harvestmen) have suchlike tarsi on all legs (as do Chresmodidae): the other four restrict antenniform feet to the foremost pair (as in the adjacent amblypygid). But as the epithet "antenniform" might suggest, these arachnids' augmented tarsi are entirely sensorial in function, in contrast to the chresmodids' ambulatory ones; furthermore, the members of the cited orders are exclusively terrestrial. In the 174 years chresmodids have been known their taxonomy has been a subject of prolonged debate and confusion. Ernst Friedrich Germar (1786-1853), author of the name Chresmoda (Germar, 1839), initiated the mess when he attributed that moniker to a colleague despite the work in the descriptive monograph being clearly his own; numerous species–Pygolampis gigantea (Germar, 1839), Propygolampis bronni (Weyenbergh, 1874), Saurophthirodes mongolicus (Ponomarenko, 1986), Sternarthron zitteli (Haase, 1890), Gryllidium oweni (Westwood, 1854)–and the genus Halometra (Oppenheim, 1888) were synonymized with the type (C. obscura) over the years (Handlirsch, 1906), often being initially classified in a separate order from their senior synonym: indeed, the poorly preserved S. zitteli was frequently classified as an arachnid (Petrunkevitch, 1955; Kuhn, 1977; Rowland & Sissom, 1980), and even compared to the bizarre sea spiders (class Pycnogonida) (Frickhinger, 1999) in what was probably an instance of systematist's desperation (akin to writer's block). The Chresmodidae played taxonomic musical chairs for many years, being placed in the orders Mantodea (Germar, 1839), Hemiptera (Popov, 1980), Orthoptera, Phasmatodea (Martynov, 1928), Paraplecoptera (="Grylloblattaria") or floating somewhere in the clade Archaeorthoptera/Gryllones/Orthopterida (Rasnitsyn & Quicke, 2002). They have been regarded as water measurers (Hydrometridae), a living family of twig-like gerromorphans (Oppenheim, 1888); Frank M. Carpenter, then-curator of fossil insects at Harvard, alleged in 1992 that the holotype of Chresmoda was actually a plain ol' locust that had been accidentally confused with the typical chresmodid Propygolampis (Carpenter, 1992). Whodathunkit? However, Carpenter ungraciously kicked the bucket before he could elaborate on his theory, and searches of his workplace for drafts of a forthcoming manuscript substantiating his hypothesis turned up nothing. By far the most frequent ordinal attribution (if any) for Chresmodidae, however, is to the Phasmatodea, or stick and leaf insects. Some even went so far as to include the living Phylliidae (leaf insects) in the superfamily Chresmodoidea (Sharov, 1968). Unfortunately, the phylogeny of the Phasmatodea is, for lack of a better word, unclear; one predominant school of thought regards them as the sister-group of the Orthoptera (grasshoppers, crickets, etc.) (Beutel and Gorb, 2006): the other, as close kin of the Embioptera, an obscure order of subsocial insects known in the vernacular as webspinners. 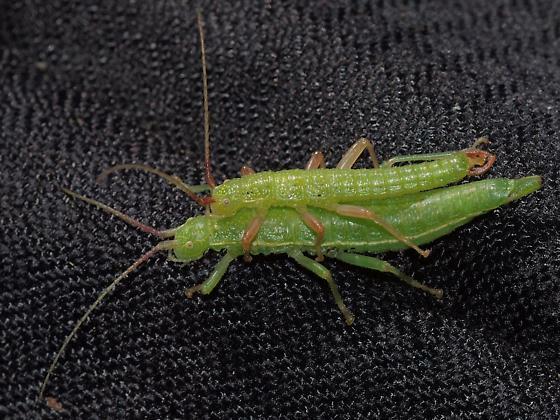 Orthopterans and embiopterans are so dissimilar that there appears to be little opportunity for compromise. Another view holds that extant Phasmatodea are not even monophyletic, with the oddball Timematidae being more closely related to Notoptera (icecrawlers and rockcrawlers) than to the remainder of the living species (Euphasmida) (Kjer et al., 2004). Additionally, the identity of the prehistoric taxa to which the Chresmodidae are obviously related (yes! There are some!) has been debated over the years. These mostly Mesozoic fossils–of which the Cretaceous-Paleogene Susumaniidae (Gorochov, 1988), the Jurassic Necrophasma (Martynov, 1928), and the Triassic Aeroplanidae (Tillyard, 1918) are some examples–have been often classified as Phasmatodea (Gorochov, 1994), but for the most part they consist only of wings, meaning that their identity as stick insects is based entirely upon venation. Well and good, except that their putative living kin's wings are reduced and heavily sclerotized, if not absent outright, making modern stick insect wing venation difficult and/or impossible to study (Wedmann et al., 2007). Furthermore, since the body is usually lacking in these fossils, in them one cannot confirm the presence of a vomer (a portion of male stick insects' naughty bits): a telltale apomorphy of modern phasmatodeans. (Significantly, chresmodid males lacked a vomer.) Hence, these purported basal stick insects' identification has been doubted (Tilgner, 2001). However, the twin discoveries of Gallophasma–a clichéd "missing link" between the alleged pre-Neogene Phasmatodea and their present-day ilk (Nel et al., 2010)–and a susumaniid with a vomer (Nel & Defosse, 2011) would seem to confirm that chresmodids are, indeed, stick insects (although controversy remains; Bradler and Buckley, 2011). If so, then I must say that they are weird stick insects. Andersen, N. M. (1982). The Semiaquatic Bugs (Hemiptera: Gerromorpha): Phylogeny, Adaptations, Biogeography and Classification. Klampenborg: Scandinavian Science Press. Beutel, R. G. and Gorb, S. N. (2006). A revised interpretation of the evolution of attachment structures in Hexapoda (Arthropoda), with special emphasis on Mantophasmatodea. Arhropod Systematics and Phylogeny, 64(1), 3-25. Brusatte, S.L. and Sereno, P.C. (2007). A new species of Carcharodontosaurus (dinosauria: theropoda) from the Cenomanian of Niger and a revision of the genus. Journal of Vertebrate Paleontology, 27(4). Carpenter, F. M. (1992). Superclass Hexapoda. In Moore, R. C. and Kaesler, R. L. (eds. ): Treatise on Invertebrate Paleontology, R, Arthropoda pt. 4. Boulder & Lawrence: Geological Society of America & University of Kansas Press. Frickhinger, K. A. (1999). Die Fossilien von Solnhofen (vol. 2). Korb: Goldschneck. Germar, E. F. (1839). Die versteinerten Insekten Solnhofens. Nova Acta Leopoldina Carolina Akademia, 19(1), 187-222. Gorochov, A. V. (1988). On the classification of fossil orthopterans of the superfamily Phasmomimoidea (Orthoptera) with a description of new taxa [in Russian]. Trudy Zoologicheskogo Instituta Akademii nauk SSSR, St. Petersburg; 178, 32-44. Gorochov, A. V. (1994). Permian and Triassic walking sticks (Phasmatodea) from Eurasia. Paleontological Journal, 28(4), 83-97. Haase, E. (1890). Beiträge zur Kenntnis der fossilen Arachniden. Zeitschriften der Deutschen Geologischen Gesellschaft, 42, 629-657. Handlirsch, A. (1906). Ein Handbuch für Paläontologen und Zoologen. Leipzig: Engelmann. Kjer, K. M.; Carle, F. L.; Litman, J.; and Ware, J. (2006). A molecular phylogeny of Insecta. Arthropod Systematics & Phylogeny, 64(1), 35-44. Kuhn, O. (1977). Die Tierwelt des Solnhofener Schiefers (5th edition). Wittenberg: Ziemsen. Martínez-Delclòs, X. (1991). Insects hemimetàbols del Cretaci inferior del España. Tafonomia i Paleoautoecologia. University of Barcelona: doctoral thesis. Martynov, A. V. (1928). A new fossil form of Phasmatodea from Galkino (Turkestan), and on Mesozoic phasmids in general. Annals and Magazine of Natural History, 10, 319-328. Nel, A.; Azar, D.; Martínez-Delclòs, X.; and Makhoul, E. (2004). A new Upper Cretaceous species of Chresmoda from Lebanon–a latest representative of Chresmodidae (Insecta: Polyneoptera inc. sed. ): first record of homeotic mutations in the fossil record of insects. European Journal of Entomology, 101(1), 145-151. Nel, A.; Delfosse, E.; Robillard, T.; and Petrulevičius, J. F. (2010). An early winged crown group stick insect from the Early Eocene amber of France (Insecta, Phasmatodea). Systematic Entomology, 35, 340-346. Oppenheim, P. (1888). Die Insectenwelt des lithographischen Schiefers in Bayern. Palaeontographica, 34, 215-247. Petrunkevitch, A. I. (1955). Arachnida. In Moore, R. C. (ed. ): Treatise on Invertebrate Palaeontology, Part P, Arthropoda Pt. 2 (vol. 2) (pp. 42-162). Lawrence: Geological Society of America & University of Kansas Press. Ponomarenko, A. G. (1985). Fossil insects from the Tithonian "Solnhofener Plattenkalke" in the Museum of Natural History, Vienna. Annalen des Naturhistorischen Museums in Wien, 87A, 135-144. Popov, Y. A. (1980). Superorder Cimicidea Laicharting, 1781. Order Cimicina Laicharting 1781. In Rohdendorf, B. B. and Rasnitsyn, A. P. (eds. ): Historical development of the class of insects. Trudy Paleontologicheskogo Instituta, Akademiya Nauk S.S.S.R., Moskva; 175, 58-69. Rasnitsyn, A. P. and Quicke, D. L. J. (2002). History of Insects. Dordrecht: Kluwer. Rowland, J. M. and Sissom, W. D. (1980). Report on a fossil palpigrade from the Tertiary of Arizona, and a review of the morphology and systematics of the order. Journal of Arachnology, 8, 69-86. Sharov, A. G. (1968). Filogeniya ortopteroidnykh nasekomykh. Trudy Paleontologicheskogo Instituta, Akademiya Nauk S.S.S.R., Moskva; 118, 1-216. Tilgner, E. (2001). The fossil record of Phasmida (Insecta: Neoptera). Insect Systematics and Evolution, 31(4), 473-480. Tillyard, R. J. (1918). Mesozoic Insects from Queensland. 3. Odonata and Protodonata. Proceedings of the Linnean Society of New South Wales, 43, 417-435. Wedmann, S.; Bradler, S.; and Rust, J. (2007). The first fossil leaf insect: 47 million years of specialized cryptic morphology and behavior. Proceedings of the National Academy of Sciences of the USA, 104(2), 565-569. Westwood, J. O. (1854). Contributions to Fossil Entomology. The Quarterly Journal of the Geological Society of London, 10, 378-396. Weyenbergh, H. (1874). Varia zoological et paleontologica. Periodico Zoologico, Sociedad Entomologica Argentina; 1, 77-111.